Don’t waste your money on expensive store-bought Halloween costumes for children – make your own Halloween costumes from thrift store buys and other easily obtainable materials. 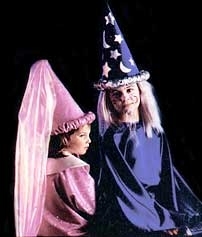 Even young children should be able to help with some stages of their disguise creation. Here are six homemade Halloween costume ideas for kids, with suggestions for supplies and photos to help your visualize how each costume can look. — feather to embellish hat. Have your child get dressed in green pants and sweater. Top with the oversized green t-shirt and cinch with a belt to make a tunic. Make a triangular green hat from paper or felt (see link below for how-to’s), embellish hat with a feather or two, and secure with elastic cord stapled on either side of the hat, to go under the chin. Have your child carry the bow, or tuck it into the belt; leave the arrows at home. Here’s a short video tutorial that shows you how to make an easy paper hats suitable for kid’s parties or homemade costumes. Sheets of newspaper can be folded in the same way for larger versions of the same traditional pattern. This costume pattern is adjustable to fit the size of your child – just draw the pieces in a suitable size. Follow the photo for design ideas. From the white plastic, cut one rib cage and pelvis, four arm bones and four leg bones for the front of each costume. Attach with your choice of glue. To increase visibility and safety in the dark, you should also attach reflective tape, or more skeleton pieces, to the back of the costume. You’ll need lots of black and white face makeup; the recipe for Clown Makeup on this page would work for the white base; outline eyes, nose and mouth in black. Optional: cover child’s hair with a a white shower cap OR a white cloth rolled up bandanna-style. Image shown at left is an adult scarecrow costume available from Amazon, but you can easily make your own. Cut holes for your head and arms in a clean burlap bag and use as a tunic, or simply use a straw colored track suit. Embellish with straw or raffia, and tie a rope around your waist as a belt. If desired, sew or glue on plaid patches for extra color. A battered straw hat, oversized flannel shirt and patched jeans are another scarecrow option; just add colorful plaid patches, add lengths of straw to the hat as hair, and stuff the pockets with straw or raffia. Face makeup is optional on the scarecrow, although a white face, with “stitched on” lips and a red triangle nose are fairly traditional. — poster board and elastic OR fabric, for the hat. Have your child put on the sweater and a long, full skirt, preferably one with shimmery highlights in the fabric. Thrift stores usually have a good selection of full-length evening skirts. If necessary, cut the skirt from a long dress and either cinch with a belt or make a waistband threaded with elastic. Create the bodice from a ladies nightgown, worn over the sweater. Cut nightgown to fingertip length on your child, then gather the hem from the center front and bring it up to the waist (see photo for detail), securing with thread, hot glue or a safety pin. If desired, repeat this effect at the back. Finally, make a cone shaped hat from poster board. Staple long colored ribbons or streamers from the hat top. Secure hat around the chin with elastic stapled on either side of the hat, just behind the ears. Alternatively, you can follow this free sewing pattern to make a Medieval Hat. Big clothes and bright colors help make a good clown costume. Use fabric paint or markers to decorate an oversized track suit, and embellish by sewing pompoms, yo-yo circles or ruffles around the neck, wrists and ankles. Have you child wear a cone shaped paper hat or a clown wig. For facial features, use clown makeup or a clown mask. Here’s a recipe for Clown Makeup, plus you’ll find free clown masks on our sister site, Allfreeprintables, including a Full Color Printable Clown Mask and Ready-to-Color Printable Clown Mask. Since this costume relies more on face makeup than anything else, we have provided two examples of homemade cat faces that you could copy for Halloween. As you can see, the girl’s fantasy cat face is very colorful and intriguing, providing a surprise note to this theme. The boy’s face is more traditional. It’s your choice! Arrange girl’s hair like the model in the photo, creating two cat ear shapes on either side of the head. You can also use a hairband with triangles of fun fur, felt or construction paper attached to represent the cat ears. Have your child wear a track suit color-coordinated to the cat face that you have in mind. Attach a length of fun fur to the back of the pants as a tail.